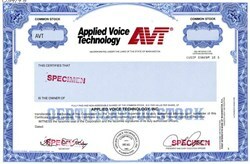 Beautifully engraved certificate from Applied Voice Technology, Inc. This historic document was printed by the Security-Columbian United States Banknote Company and has an ornate border around it with a vignette of the company's logo. This item has the printed signatures of the Company’s President and Chief Executive Officer, and Secretary. Applied Voice & Speech Technologies, Inc. (AVST) is a privately held software company headquartered in Orange County, California. It specializes in developing business communications solutions focusing on medium to large enterprise, government, higher education, healthcare, and hospitality markets. The company is known for its primary product, a speech-enabled unified communications platform, called CX-E (formerly CallXpress). CX-E applications include call processing, voicemail, unified messaging, personal assistant, mobile client, automated attendant, uniform call distribution (UCD), fax, speech, notification and other business process capabilities. AVST is one of the few switch independent developers of unified messaging/unified communications solutions. The company's history goes back to the 1980s when the first versions of Intel server-based voice messaging and call processing systems were released. The CallXpress product originated from Applied Voice Technology (AVT, NASDAQ:AVTC) which later became Captaris, Inc. In 2003, Sound Advantage purchased the CallXpress Voicemail and Unified Messaging solution from Captaris and this merger of technologies became a new entity called Applied Voice & Speech Technologies, Inc. (AVST). The acquisition included the retention of key products and technology as well as the entire product engineering, support and sales teams. AVST was established in September 2003 by the merger of Sound Advantage (established in 1997) and the AVT division (established in 1982) of Captaris, Inc. (NASDAQ: CAPA). The first AVST release, CallXpress 7.0, was in April 2004. Frost & Sullivan recognized AVST with the 2004 Entrepreneurial Company Award for its sound marketing strategy and identification of a new and exceptional product solution. In September 2004, AVST announced further validation of its strength in the market by procuring $10 million in new funding from Ignition Partners and Dolphin Equity Partners. Shortly after, in November 2004, AVST introduced CallXpress 7.5 which provided the Centigram telephone user interface emulation. CallXpress 7.5 also offered user administration via Microsoft Active Directory and SMTP message notification. In 2005, AVST expanded worldwide by adding 30 new resellers to its list of channel partners. Some of the significant partnerships included Shared Technologies and NetVersant. In May 2005, the company released another version of its product, CallXpress 7.7, which emulated the Octel Serenade (VMX) telephone user interface. CallXpress 7.7 received the Frost & Sullivan 2005 Product Differentiation Innovation Award for the North American enterprise voice and unified messaging solutions market. In 2006, VARBusiness awarded AVST with Five Star Partner Program Winner for its innovative Marketing in a Box (MIB) program, which enables resellers to brand their AVST business through effective communication with customers and prospects. Version 7.8 of CallXpress was released on June 2006. It emulated the Avaya Intuity Audix user interface. In early 2007, AVST expanded its global presence by adding Teltronics, Inc. (OTCBB: TELT) to its reseller partners. In February 2007, AVST made a contribution to market awareness with the launch of a unified messaging educational website. This website is an information portal containing white papers, industry research, videos, case studies and recent industry news on unified messaging and unified communications. The site hosted by ITworld.com included AVST as its sponsor. In June 2007, the company unveils CallXpress 7.9 that offered four types (called the four flavors) of unified messaging: server-based; client-based; secure and simplified. To assist the easy acquisition of complete solutions for businesses of any size, in August 2007, AVST introduced the CallXpress Speed Bundles. The solution was designed to support the small to medium business (SMB) marketplace. In 2008, AVST was named the top Unified Messaging Provider according to COMMfusion report. The company was identified as having the most complete UM solution. At the end of 2008, the company's product was enhanced with the speech-to-text feature (STT). In 2010, AVST acquired Active Voice, a division of NEC Corporation of America. NEC became AVST's OEM partner, integrating CallXpress 8.0 Unified Communications platform with NEC's IP telephony and Unified Communications solutions. With the Active Voice acquisition, AVST also acquired Active Voice product lines including the Repartee LX unified communications solution designed for the hospitality industry. Also in 2010 AVST introduced UCConnect™, an open development environment for applications. In summer 2010, AVST announced it had entered into a letter of intent to purchase certain assets of British Columbia-based Voice Mobility International, Inc. As part of the transaction, AVST acquired Voice Mobility UCN250 software as a service (SaaS) platform and all related technology and customers. In February 2011, AVST completed an agreement for the exclusive use of Voice Mobility’s unified communications cloud technology, including all intellectual property related to the UCN250 unified communications as a service (UCaaS) platform. In late 2010, AVST selected United Kingdom-based Oak as a distribution partner in that country. Then in 2011, the assets of Beacon Solutions were acquired by AVST. As part of the agreement, AVST acquired Beacon’s technology assets; a set of custom developed vertical CEBP applications for healthcare, education and government; technical expertise and the company’s existing customer base. In March 2012, AVST changed the name of its CallXpress platform to CX-E. During this same period, AVST launched the CX-S and CX-C product lines. The CX-E solution focuses on medium- to large-sized companies and organizations, while CX-S on smaller companies. CX-C represents a cloud-based UC platform. In 2013, AVST released Atom, a virtual 24/7 office manager application with location-based services, federated presence and a multi-lingual speech interface for the workplace. Also during 2013, AVST announced added support of hybrid UC cloud deployments in CX-E with more integration to Gmail and Microsoft Office 365, including unified messaging, calendaring, contacts and message waiting indicator. In summer 2014 AVST introduced CX-H (formerly Repartee LX), a unified communications solution designed for hospitality industry. In 2015, AVST achieved two Microsoft Gold Competencies which ranked the company as a member of the top one percent within the Microsoft Partner Ecosystem. The Microsoft Gold Communications Competency was attained for CX-E’s integration with Skype for Business and the Microsoft Gold Messaging Competency is for its expertise in Exchange environments. In October 2015, AVST released CX-E 8.7. The release provided enhancements to Atom, the context-aware personal assistant, which included Microsoft Hyper-V support for virtualization and GENBAND EXPERiUS integration to enable migration to the cloud. Captaris, Inc., develops software that automates paper and other document-centric processes, offering a selection of products marketed under the names Captaris RightFax, Captaris Workflow, and Captaris Alchemy. The company's software, which is tailored for paper-intensive businesses such as banking, insurance, and healthcare, is used by all Fortune 100 corporations, helping customers orchestrate the delivery, management, routing, tracking, and archiving of data and documents. Open Text's Fax and Document Distribution Group, formerly Captaris, has office locations all over the globe. Captaris took on several guises during its first two decades of business, demonstrating a nimble approach to the markets it served. The company began as Applied Voice Technology, Inc., a firm founded in 1982 in suburban Seattle, Washington. During its first decade in business, the company developed software and hardware for voice and call processing, competing in the computer telephony market. Commonly referred to as CTI, for computer telephony integration, the computer telephony market addressed the need to unite telephones and personal computers, two of the most essential business tools. The first voice- and call-processing systems were rudimentary by later standards, performing the basic functions of call answering, routing, and messaging. Although telephone systems became more sophisticated, thereby increasing the complexity and capabilities of CTI, the technological advances recorded in the personal computer industry were largely responsible for propelling CTI forward, making the integration of telephone and computer a vital and intricate business. Applied Voice, regarded as a pioneer in the CTI field, helped advance the capabilities of CTI during the first chapter in its history, but as changes in the marketplace occurred, the company shifted its strategy, giving birth to Captaris, a leader in automating paper and other document-centric processes that proliferated in the corporate world.